It's been a bad few days of news for the embattled grocery giants. The axe metaphors are out in force today today. Just one day after it emerged Tesco was planning to slash up to 10,000 jobs, Morrisons has confirmed it will be chopping prices, presumably in a bid to head off the threat from discount rivals Aldi and Lidl. The price of more than 130 staple products will be cut by an average of 22%, with the price of the supermarket’s own-brand spinach tagliatelle cut the most, at 56%. Four pints of milk will be cut from £1.39 to £1, good news for consumers if not for the already struggling dairy farming industry. 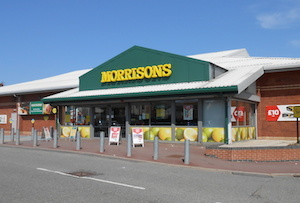 The move suggests Morrisons is making a play for the bottom end of the market, which has been well catered to by German discount chains Aldi and Lidl for the last few years. On Friday data from Nielsen suggested the pair had now grabbed a combined market share of more than 10%. As well as cutting prices, Morrisons has announced plans to close 10 of its 514 superstores and its chief executive Dalton Philips is leaving the business today as the board searches for a new boss with fresh eyes.The business is currently being run by its chairman Andy Higginson, so the price cuts are likely to be a sign of him making his mark. But there’s only so much Morrisons can do. From packaging to store layouts and the size of their ranges, Aldi and Lidl are designed from the ground up to be low cost, so Morrisons will need to find other ways to compete as well. Morrisons’ news follows reports yesterday that Tesco is planning to cut up to 10,000 jobs in a restructure of mid-management and the company’s store portfolio. The Sunday Telegraph said that 6,000 of these would come from a restructuring of its head office and the already-announced closure of 43 of its stores. The remainder would be cut in a shake up of how Tesco’s stores are run. The supermarket’s chief executive, Dave Lewis, reportedly wants to remove a whole layer of management between store managers and the shop staff. Lewis certainly has prior experience as a slasher - back in his Unilever days he earnt the nickname ‘Drastic Dave’ after cutting 300 jobs and slashing costs by 40%. Data last week from Kantar Worldpanel suggested that Tesco had turned a corner, as the only one of the 'big four' supermarkets to post growth, even if it was just of 0.3%. But the supermarket has warned its profits for this year are likely to be less than half the £3.3bn posted last year, so keeping costs down is likely to be a priority as grocery deflation shows few signs of slowing.